● 1 or 2: This card cannot be destroyed by battle or card effects, until the end of your opponent’s turn. ● 3 or 4: Draw 2 cards. ● 5 or 6: This card can attack directly this turn. Orgoth the Relentless is a card from the show that I’m happy to see brought into reality. Obscure one-shot card with a great effect in real life. Dice roll effect once per turn is a cool nod to Duke Devlin. Three rolls and an ATK/DEF boost x 100 for the total of the three rolls. The boost lasts until your opponents turn ends, keeping Orgoth at the very least 300ATK/DEF higher than he started. The real benefit is if you roll doubles or even triples of a number. Three different effects for a double roll, you get all the effects if you roll triple, which I love because if you roll three same numbers in a row you should get a reward. Protection from any destruction until your opponents turn ends is pretty good. Drawing two cards is always welcomed when there are no drawbacks to it (Reckless Greed). A direct attack from Orgoth this turn may seem like the least popular, but remember, that means a double 5 or 6 roll, so at the least, Orgoth’s ATK/DEF will have risen 1100. 3600 direct damage is game-closing damage if this doesn’t happen in the opening turns. Max potential is rolling the devils number, getting the 1800ATK/DEF boost, and having your opponent stare down a destruction-proof, 4300 Orgoth that can attack directly and who just gave you two cards. The chances of that are slim, but they can and will happen. Overall, Orgoth is a pretty good card. Level seven isn’t too bad, Warrior and EARTH support behind him, and an effect that can be used each of your turns and can really make things interesting. If you want consistency, Orgoth isn’t for you, but for others, he may be one of those cards you can throw in and cause some havoc with. Orgoth the Relentless is amazing. Orgoth is a Level 7 Earth Warrior-type monster with 2500 Atk and 2450 Def. The stats are ok, though I do wish there was a Special Summon clause. If the effects aren’t negated, Orgoth can be summoned any way to roll 3 dice to gain a bunch of effects. It can only be activated once per turn during a Main Phase, but I like that it isn’t tied to a Summon. After rolling the 3 dice (there is no cost to the effect) the results are added and multiplied by 100 to increase Orgoth’s Atk and Def by the result. If any 2 of the results are the same, you get protection, the chance to draw 2 cards, or the ability to attack directly. If all 3 rolls are the same, you gain all 3 effects. Orgoth has some of the most complicated math in Yugioh which is interesting because Dungeon Dice Monsters is easier than Yugioh!. With a complicated effect, Orgoth isn’t going to be in every deck, especially since dice rolling is inherently inconsistent. However, Orgoth has some of the nicest looks and a great name. I tried to do a gender neutral review because I think of Orgoth as Zelda in one of her Guardian things. Worth it. Score: 2-4/5 Roll some dice or just take the middle result. 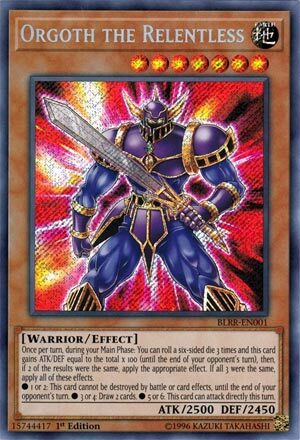 Duke Devlin’s ace has finally come to the TCG card game, say hello to Orgoth the Relentless. Orgoth is a Level 7 EARTH Warrior with 2500 ATK and 2450 DEF. Stats are ok for a Level 7, Warrior is a good typing despite being Level 7, and EARTH is a good attribute. Once per turn, during your Main Phase you can roll a six-sided dice three times and this card gains 100 ATK and DEF times the total you rolled with your dice. If two of the results were the same, apply the appropriate effect or if all three were the same, apply all the effects. Note the attack gain and the corresponding effects last til the end of the opponent’s turn. 1 or 2: This card cannot be destroyed by battle or card effects. Dice roll effects are never reliable cause you never know what probability has in store for you. I don’t want to do the math to figure out the probability of getting one or all of these effects, but I’d say it is between 1/36 and 1/216 so I don’t know how often you’ll see them happen. Being able to get stronger though is nice, though the lowest you can gain is 300 ATK but if you are gaining 300 ATK, it is because you rolled all 1s and you’ll get all the bonus effects. The bonus effects are good, tbh. Any destruction protection is solid, though relies on probability to get it instead of just naturally being an effect. Any chance to draw 2 cards is good, and being able to attack directly with a monster that likely has more than 3000 ATK is great. Orgoth is a fun card to mess around with, though not great. Art: 4.5/5 I’ll give it to Orgoth, he looks cool. Okay, for the first of this plethora of effects, you get to roll a die three times. Orgoth gains attack equal to 100x the total cumulative results. So let’s break that down a bit. But statistically…you have a 1 in 6 shot (or 16.67% chance repeating exactly) of any given result. That result is divided by 6 each subsequent roll, when going for a duplicate in terms of the effect. It’s not a cumulative of that per roll. So roll 2 gives you a 2.78% repeating chance on the next roll, and your final roll yields you about a .5% chance (.4629 repeating and that’s to 50 places on my calculator before it changes). Wow. This card finally came out. I waited long enough. It was so epic in the anime, and I always wondered why it never came out. Orgoth has a dice-related effect, thematic to Duke Devlin, but this makes it inconsistent. 3 x 1-6 means that the ATK can be anywhere from a pathetic 300 ATK increase to a considerable 1800 ATK increase. 4300 is the peak, but a respectable 3400 is the average. From a probability standpoint, the first two rolls have a 1/36 chance of being the same roll. And 35/36 chance in being two different numbers. The main question is what are the odds of that 3rd roll being the same number as one of those two numbers. 1/3. It has a 1/3 chance of getting out a very powerful effect and a 2/3 chance of being a big vanilla beater. Considering that high LV monsters require a deck to be built around their weaknesses to accomodate, you would expect any high LV monster to always have a big impact when its summoned. I’m not great at math. Someone correct me if I missed something. But these aren’t great odds. Hello! I read the COTD review for Orgoth the Relentless and noticed that the reviewers generally seemed uncertain of the odds of his various effects activating. I had nothing going on so I thought I’d sit down and brute-force the numbers in case any of them were interested. So simplifying the fractions it’s a 4/9 chance of an effect+attack, and 5/9 chance of just attack. And there you have it, more information on Orgoth than you could possibly ever need. Hope it helps!